DISCLAIMER: The colour ‘transects’ shown in this blog were inspired by the technique created and taught by Niall Benvie. I was asked by a customer on a workshop recently to try and recreate the effect, spurring on the thoughts and reason for this blog. Colour is an intrinsic part of photography. Even black and white photographs are created by the varying amounts of each colour present. How we capture, record, perceive and interpret colour then is extremely important. The majority of digital cameras detect three colours, red, green and blue (some new cameras have a 4 colour system but we won’t go into that!). This tri-colour system is exactly the same as our own human eyes, and through a mixture of those three colours produce an almost infinite range of colours and tones. As a photographic tool colour can often be overlooked, and tends to be more of an afterthought than an active reason for choosing a composition or subject. While there is nothing wrong with that approach it can be very useful to consider colour ahead of taking a photograph. Take the eagle image below for example - the whole shot revolves around the classic purple tones that heather in bloom creates. While that image would work without those purple tones it would certainly lose a lot of the impact it has. Colour helps us to build a story, a sense of time and place. Using colour as a photographic and compositional tool can be highly effective. Sometimes colour may be a side effect of a great sunset, it might not always be planned but will add a huge amount of interest to a scene if the sky ignites with colour (see the first example above for such a shot). The deliberate use of colour in a photograph though can take a boring composition and supercharge it. By utilising one tone or colour, and making that the focal point of an image we are unequivocally stating the intentions of our image. More than any other compositional tool colour can help us feel. While that might sound a bit ‘artsy fartsy’ this can be very obvious with the use of white balance. By ‘warming’ or cooling’ a photograph, we can give a very defined feel to a scene. Winter photography and snowy scenes will obviously suit a slightly colder feel, emphasising the apparent blue tones in a shot. Images with warm orange or red light, at sunrise or sunset, will be enhanced by shifting the white balance further to yellow end of the spectrum. 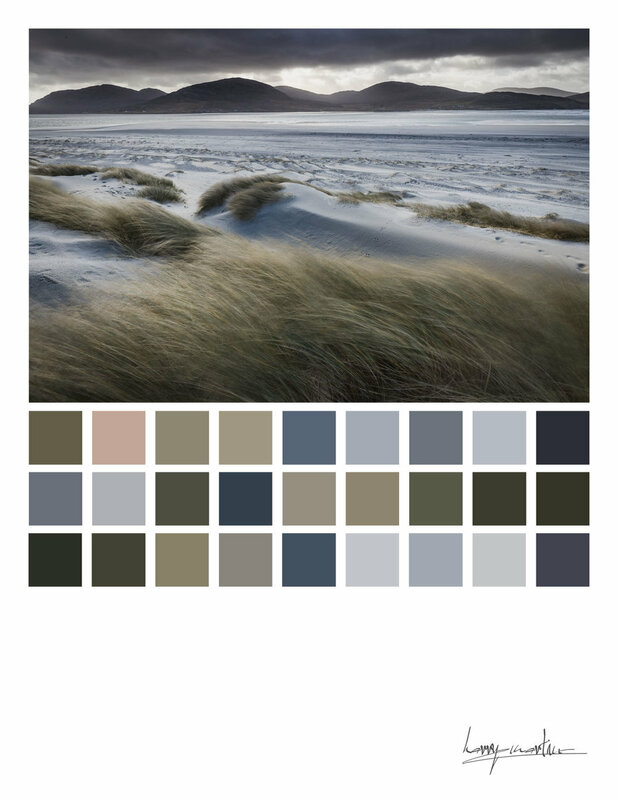 The concept of colour transects, created by Niall Benvie (find a link to his work at the start of this blog) is a fantastic way of visually illustrating the impact of colour in a photograph. While I had seen some of Niall’s work, I had never looked into colour transects before. When a customer on a week-long workshop on the Outer Hebrides asked about trying to recreate this effect it became an interesting experiment. 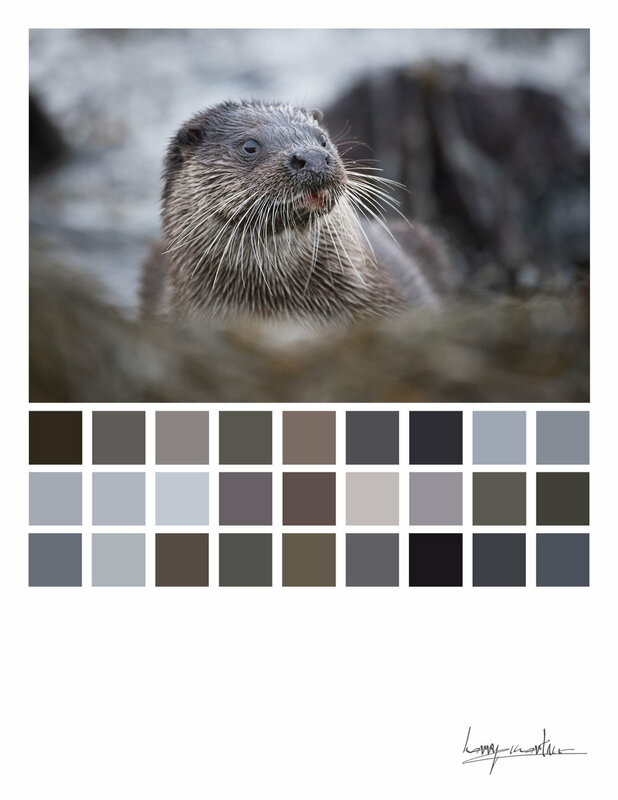 With a little trial and error we came up with our own method of creating colour box swatches below our chosen image in photoshop, and started to look at a selection of images we’d captured. It became interesting to see how in itself, creating these colour transects became an image in themselves, helping to emphasise the colours predominant in our scenes. More than anything sitting down to create colour transects made us stop and analyse our images a little more critically; not just the overall colours in the scene, but where they were, how they helped to lead a viewer’s eye. Next time you are out shooting, consider the scene in front of you - is there any particular colour that stands out? Is there way to use that to your advantage? Maybe you know you want a particularly coloured sky, whether that is bright reds and oranges, or dark brooding greys. Getting into a frame of mind where you consider your composition as a whole and everything in it will help you to plan your shots in advance, and produce something that stands out a little more. I’ll finish on a few bullet points on how you can use colour to some effect in photography. As a colour transect, this became one of my favourite creations. I love the colour contrast of blue and yellow.